Comets are small, irregularly shaped bodies of ice and rock that orbit the sun, typically in highly elongated orbits. Comet Hale-Bopp, the great comet of 1997, measured 50 miles by 24 miles; however, most comets are far smaller. Astronomers have concluded that comets originate in the cold, outer reaches of the solar system, where millions of ice-rich bodies follow long-period orbits, billions of miles from the Sun. But gravitational forces within our galaxy sometimes nudge comets toward the inner solar system, where solar radiation flashes their frozen matter to gas and unleashes powerful geysers of rocky and icy particles. The solar wind then deflects these particles and gases in a direction opposite the Sun, creating long tails, which at times can be spectacular. But comets can be unpredictable: some may brighten unexpectedly after sudden outbursts, while others may fade rapidly from view. In early 2017, two comets may be visible in binoculars: Comet 45P/Honda-Mrkos-Pajdusakova and Comet 41P/Tuttle-Giacobini-Kresak. Both comets likely were once inhabitants of the far outer solar system, but entered the inner solar system, only to have their orbital periods shortened to about 5 years by Jupiter’s powerful gravity. After having passed Earth by only 8 million miles on February 11, Comet 45P/ may be visible in our night sky from late February into early March near the constellation Leo. And, during late March and Early April, we may be able to see Comet 41P/ in the northern sky near the Big and Little Dippers. 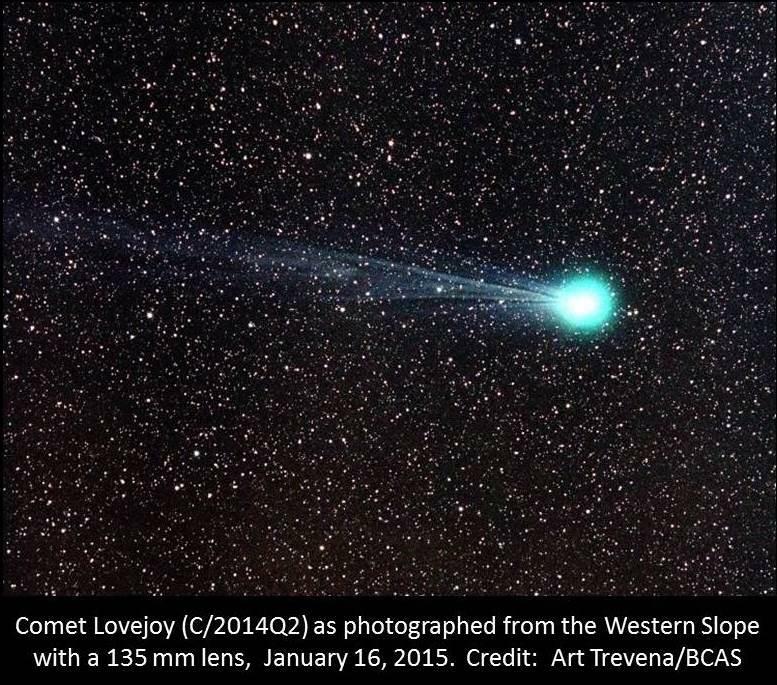 Given clear skies and cooperative comets, you may have a chance to view these two through telescopes and binoculars with sky rangers and astronomers on the evenings of February 25 and March 25 at Black Canyon of the Gunnison National Park. Or, to locate these comets yourself, use binoculars and the finder charts below.